This topic describes how to activate and register Tableau Server. Tableau Server requires at least one product key that both activates the server and specifies the number of license levels you can assign to users. 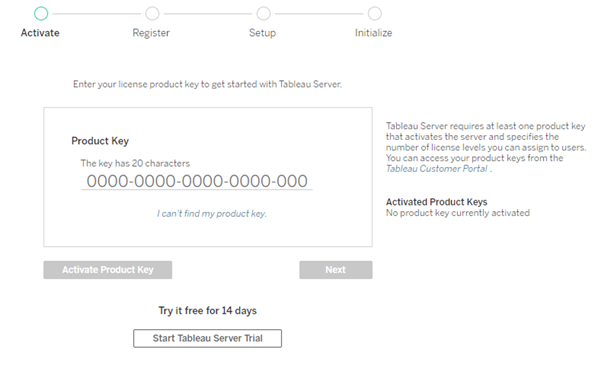 You can access your product keys from the Tableau Customer Account Center. If you need to activate Tableau Server on a computer that is offline, see Activate Tableau Server Offline. If you need to activate additional product keys to add capacity to an existing Tableau Server installation, see Add Capacity to Tableau Server. If the computer where you are installing Tableau Server has been configured to connect to the internet through a forward proxy, follow the procedure in the topic, Configure Product Key Operations with Forward Proxy, before continuing. Sign in to Tableau Services Manager Web UI. On the Activate page, Enter or paste your product key and click Activate License. Before you can proceed you must log in to Tableau Services Manager (TSM). Verify that the account you are using is a member of the Local Administrators group on the Windows computer where you are installing Tableau Server. To activate Tableau Server for production use, you must have a product key. see Activate Tableau Server Offline. After activation, you need to register Tableau Server. To do this, create a registration file and then pass it as an option with the tsm register command. Edit the template file to create your completed registration file. If you have a product key for Data Management Add-on license, and plan to enable Tableau Prep Conductor, see Install Tableau Server with Prep Conductor.